The pace of economic expansion in Asia and the Pacific has slowed considerably in recent years; with the outlook clouded by uncertainty, growth is expected to plateau at about 5% for both 2016 and 2017. Sluggish exports played a significant role in this slowdown, but so did moderate domestic demand. Worse, a confluence of downside risks could lead to further moderation in the pace of growth. Key risks discussed in the 2016 edition of the Economic and Social Survey of Asia and the Pacific are: a somewhat uncertain outlook for the economy of China against the backdrop of a fragile global economic recovery; volatility in exchange rates, including that due to low oil prices for commodity exporters; growing levels of private household and corporate debt; and an ambiguous path of interest rate increases that may be pursued by the United States of America. In taking advantage of low inflation, many economies have lowered their interest rates to support growth. It is argued in the Survey, however, that further loosening would be difficult due to considerations about capital outflow and financial stability. While many Governments have sufficient fiscal space to scale up development expenditures in areas such as education, health and infrastructure, they also need to expand their tax bases, particularly as stronger fiscal positions will be required to cope with the consequences of the economic slowdown for efforts to end poverty, reduce inequality and improve employment prospects. Also highlighted in the Survey are the multi-faceted challenges emerging due to the rising middle class and rapid urbanization in the Asia-Pacific region will test the capacities of Governments to revive economic growth and pursue sustainable development. 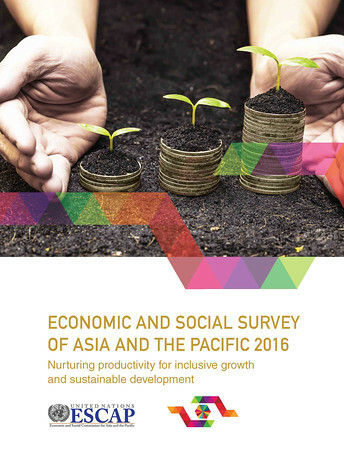 It is recommended in the Survey for 2016 that to bolster economic growth in Asia and the Pacific and effectively pursue the 2030 Agenda for Sustainable Development, Governments will need to strengthen efforts to stimulate domestic and regional demand. In addition to raising the level of public spending, steady growth in real wages will be required to sustain increases in domestic demand. However, growth in productivity – after having increased markedly over the last couple of decades – has declined in recent years. This situation is worrying not only as wage growth has lagged productivity growth, but also as wage growth ultimately depends on productivity growth. Thus, if the region is to shift to a more sustainable development strategy that is driven by domestic demand, greater focus must be placed on productivity along with commensurate increases in real wages. Thus, it is argued in the Survey for 2016 that a productivity-driven, wage-led approach would enable countries to increase their aggregate supply and their aggregate demand, thereby enhancing the well-being of their societies. In emphasizing the need for higher labour productivity in agriculture, the importance of industrialization, especially in rural areas, is also underscored. The Survey contains a warning to developing economies concerning their rapid transformation towards the services sector and leap-frogging manufacturing; however, it also contains numerous proposals to increase productivity, including an emphasis on the importance of higher-quality education to promote innovation and enhance skills. Household and corporate leverage – where do the risks lie and how do we manage?